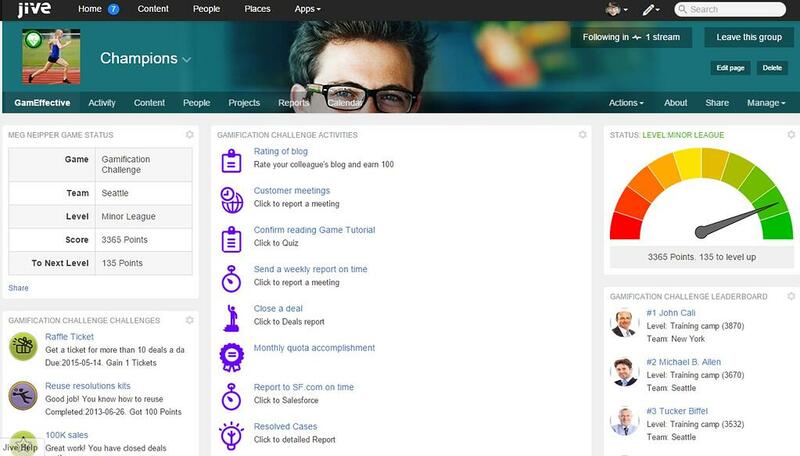 Get Jive Communication and Collaboration with GamEffective's Social Collaboration Gamification. Jive's communication and collaboration solutions help people and organizations work better together. It drives collaboration among employees and across apps, locations and departments. But strategic alignment and employee productivity with Jive requires getting a handle on Jive adoption first. This is where gamification comes in. Gamification can drive the productivity and communications gains obtained through Jive by modifying behavior to drive Jive adoption, creating a lasting change in behavior. GamEffective's next generation narrative based gamification - using narratives such as races, sports, city building and song contests - provides context, recognition and meaning to employees' activities on Jive. Pre-integrated and IT friendly, GamEffective for Jive is easy to implement, and appears as an integral part of Jive. Grow user engagement & communicate corporate goals: gamification doesn't just grow engagement, but is a great platform to drive clear communications about corporate goals and objectives. Increase collaboration: gamifciation rewards and recognizes collaboration, instilling it as a habit.